CATCHING – Pretty good! 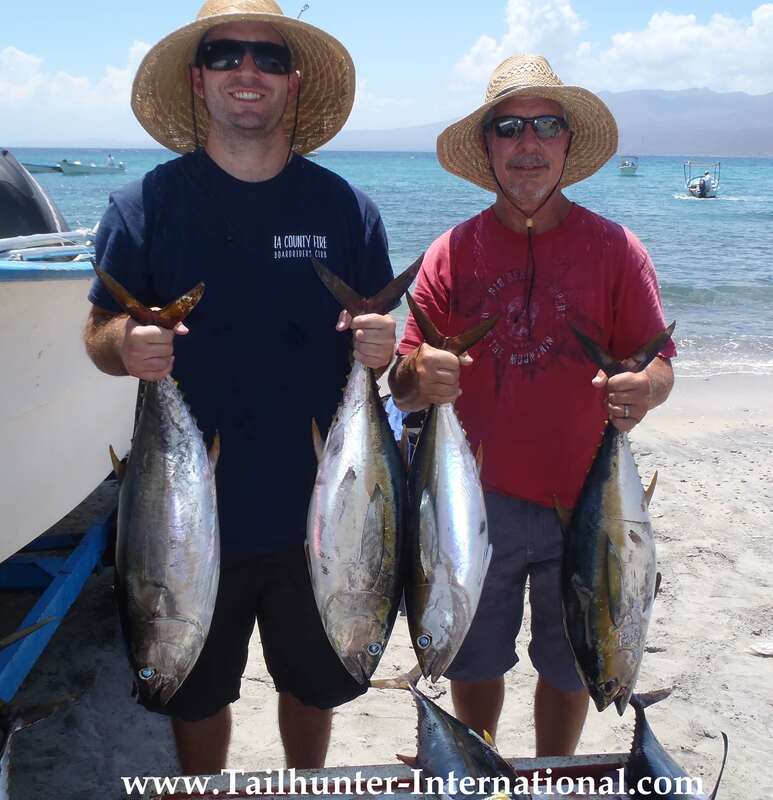 Guys still losing alot of fish, but there were alot of fish to catch so you lose one…catch the next one! 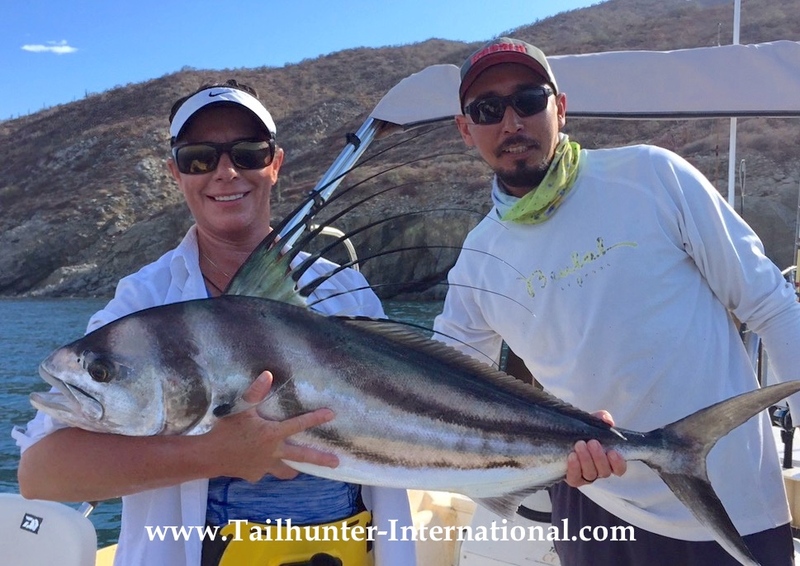 RELEASING – All roosterfish and lots of smaller dorado released! Yay! WEATHER – Been a great week. Daytime mid to high 90’s. Night in the low 80’s. Humidity manageable. WATER – Blue and warm. Just like the photos! THINGS THAT MAKE YOU GO Hmmmm : Might get some thundershowers and rain later this week. Buzz kill. Captain Victor from the Tailhunter Fleet with Pierre Soyez from France and Arnaud Pasquet from Montreal Canada. 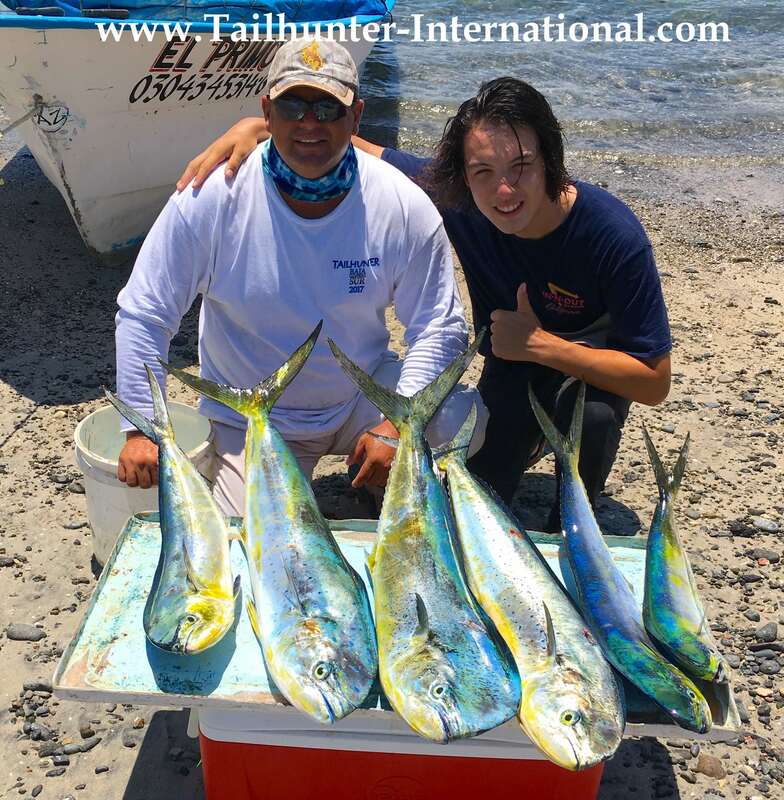 Arnaud is the producer of the reality TV fishing show, “Chasing Monsters.” Shown here with some of their tuna and dorado caught off Las Arenas. 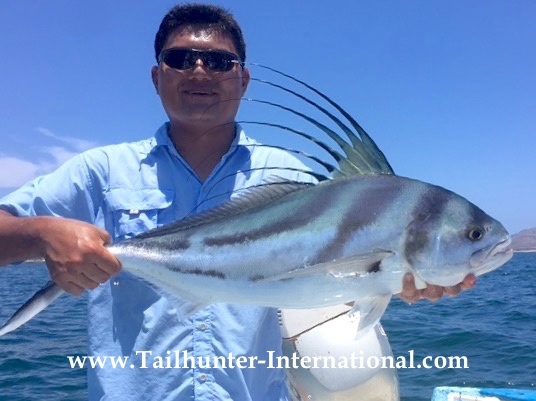 Over 8 days of fishing the pair caught almost 20 different varieties of fish including dorado, tuna, rooster fish, cabrilla, cargo and others all on light tackle. Fun fun guys! Daryl Boyd is a little camera shy? Buddy Larry Morse not so much! 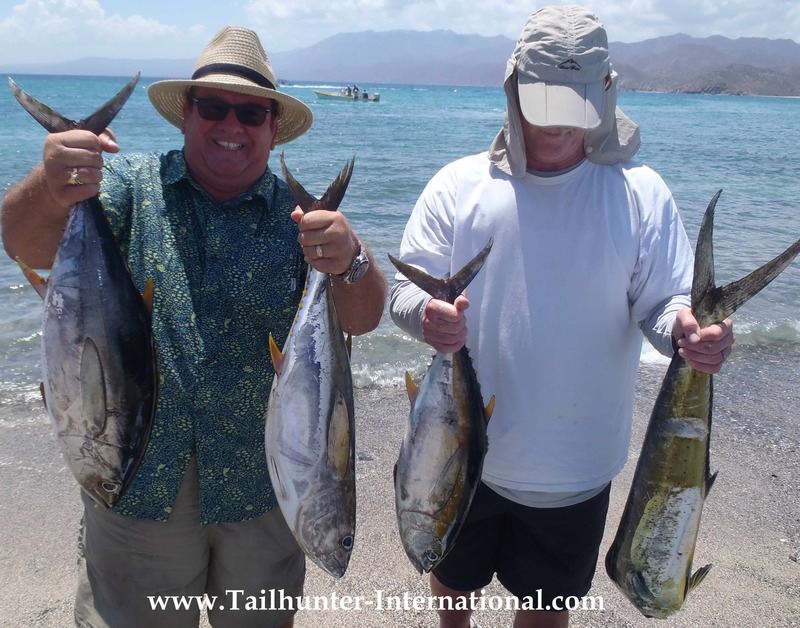 A good start to their trip with handfuls of dorado and tuna! 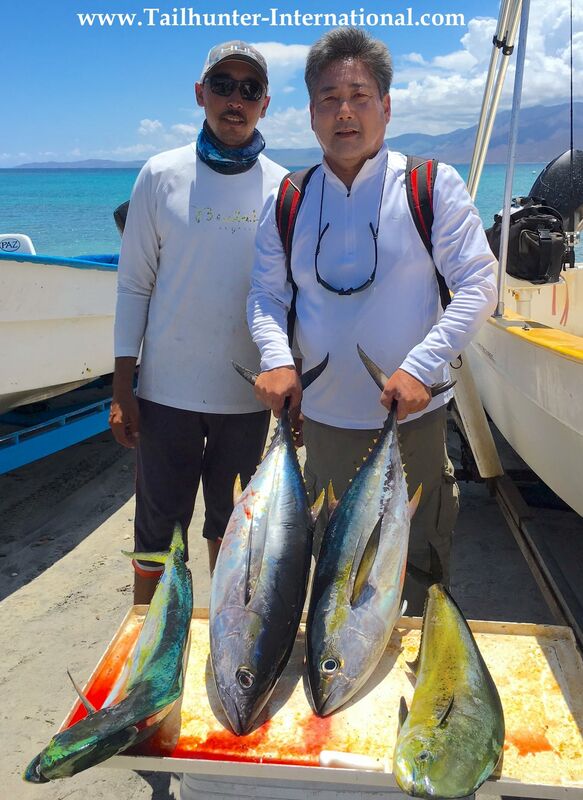 Two of our favorite guys that everyone knows here in La Paz, Jorge Romero took a day off from driving our shuttle vans to get out on the water and get in on the bite with Captain Moncho and coming back with a rack full of yellowfin tuna and dorado! 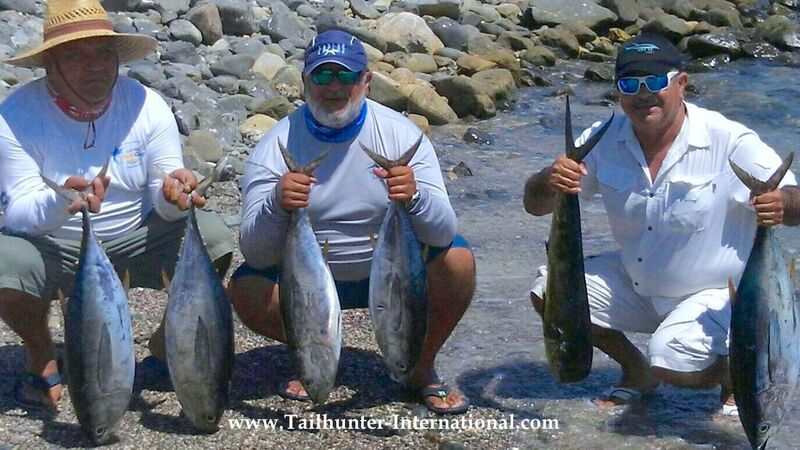 Captain Pancho with Mark Aizawa from the Bay Area with a couple of nice yellowfin and dorado headed to the ice chest. Derek Scannell and dad, Mike, both Orange Co. firefighters had 9 yellowfin and 3 dorado to kick off their fishing trip! 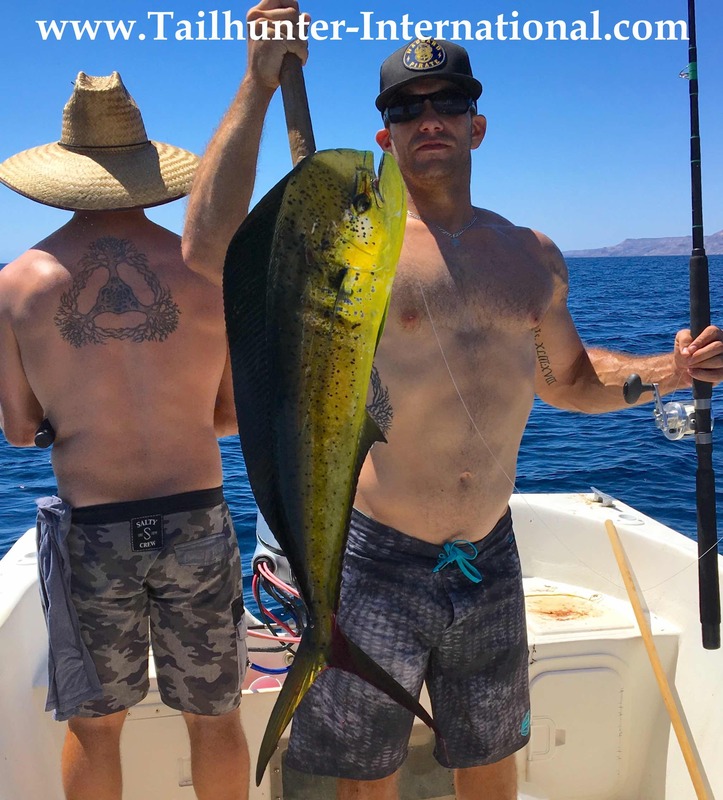 Nicholas Madrigal from S. California on his first fishing trip ever was with Captain Armando of the Tailhunter Fleet and got tuna between 10 and 40 pounds plus a load of dorado all on light tackle and with a broken finger too. Glen and son Jordan Boyd posing with one of the larger tuna of the week, but they also got a cooler fool of other tuna as well. 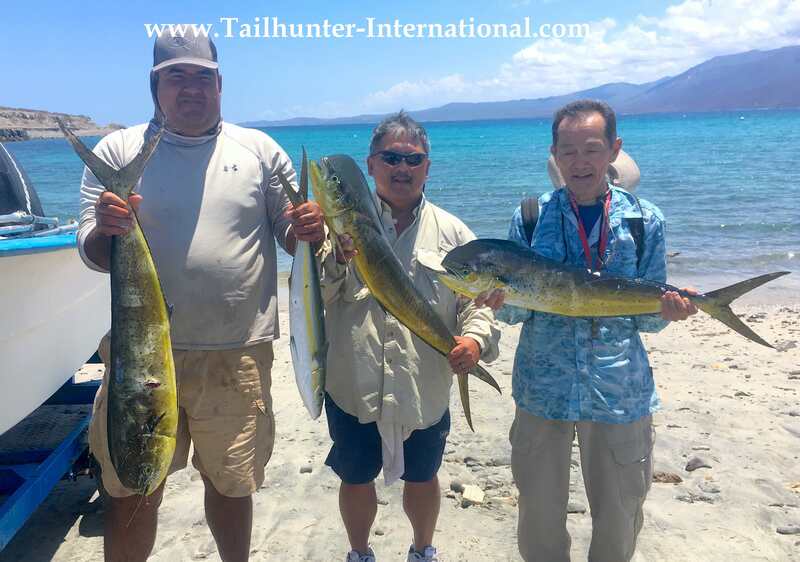 Captain Gerardo poses with Eddie and Johnny Sakuda with some double-fists of dorado plus a rainbow runner. 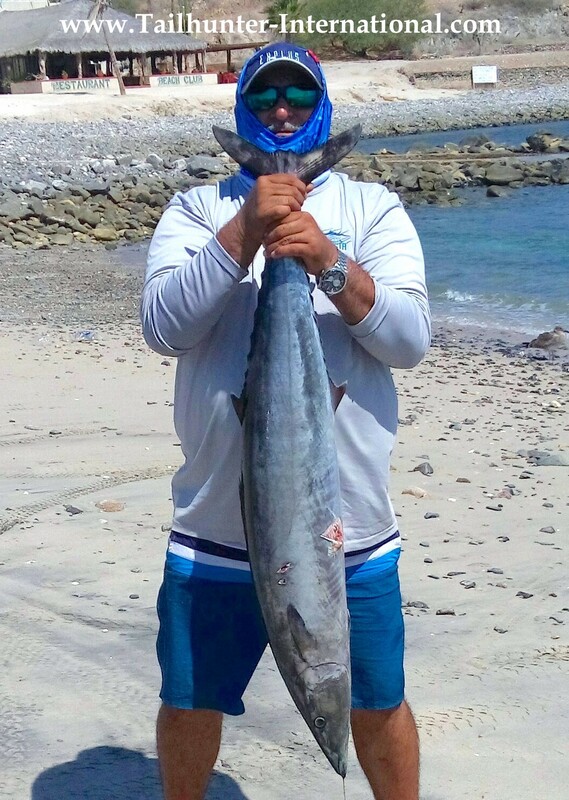 One of a couple of wahoo we got this week and showing it off on the beach at Muertos our guy, Jorge Romero! Light tackle jig maestro, Arnaud Pasquet, producer of the TV show “Chasing Monsters” spent 9 days fishing with us and got numerous species. This is just pure fun! 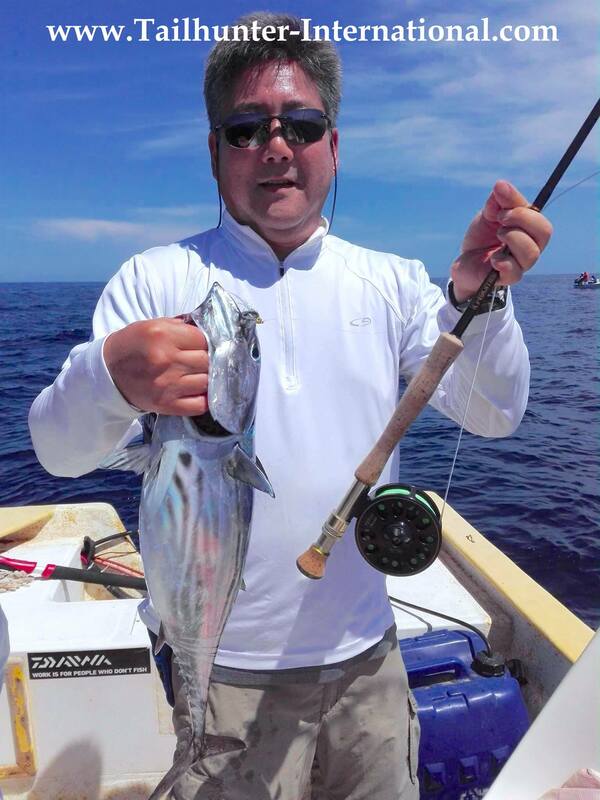 Bonito on the flyrod for Mark Aizawa. I inadertently forgot to post this great photo of a color Chris Sette and his son, Brian with just not enough hands for their dorado and tuna! Jorge Romero and brother Esteban Romero told me they drank 3 cases of beer while fishing and lost “mucho atun” but still managed to have a great time and caught 9 football yellowfin. Lots of you know Benny Munoz! He works at Tailhunter International and helps me process fish every afternoon. 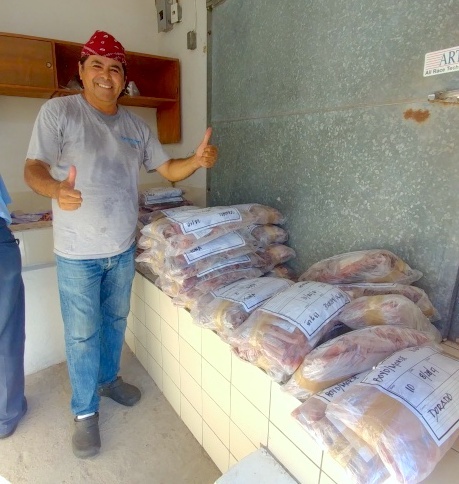 This is almost 400 pounds of tuna and dorado fillets we spent 4 hours vacuum sealing and labeling FROM JUST ONE DAY FISHING and now headed into the freezers! 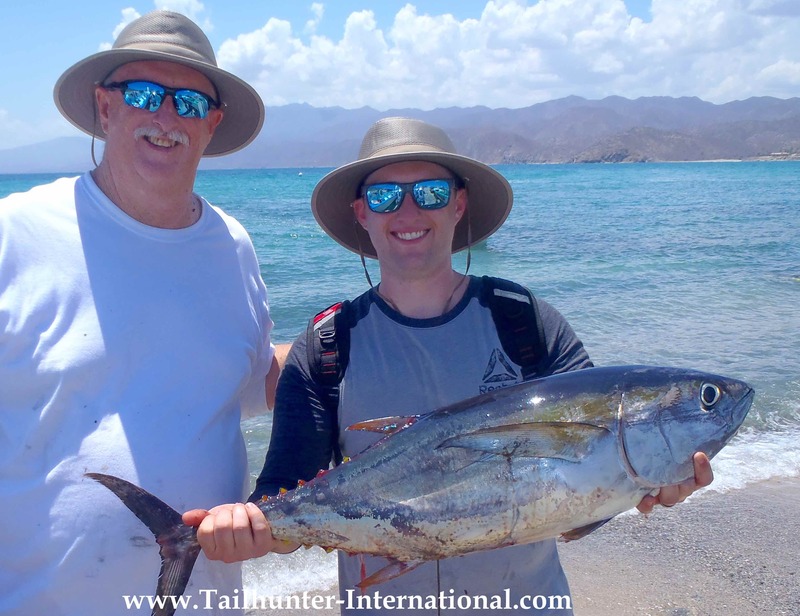 That doesn’t include all the fish that were lost…released…and got set aside for dinner that night at our Tailhunter Restaurant for us to cook up! FISH GO ON THE CHEW! I almost don’t want to get too excited because this is the kind of fishing like it should be. Like the way it used to be before El Nino. Like the way it looks in all the videos and magazines. This is what folks come for and we’ve been waiting for for almost 3 season. But, clearly, this is the best fishing we’ve seen in a long time and we can only hope it stays. We have one pair of light tackle anglers this week fishing 9 days and in that time have caught almost 20 different species of fish! It’s been that kind of week. Nature being fickle, who knows? For now, we’re sure enjoying the hot bite! We’re keeping an eye on the weather because this coming week there’s predictions for some thunderstorms and strong winds! Fingers crossed. Tuna! Tuna! Tuna! It started almost two weeks ago and has only gotten steadier. The key is finally finding some sardines for live bait. Not a lot, but surely more than we’ve seen in ages an sure enough, the tuna came up from the trench. It’s a nice mix of fish. As small as 5-8 pounds but as large as 40-50 pounds as well. Most of our pangas were getting limits to near limits of footballs in the 10-20 pound class. Perfect for live bait fishing and having fun, especially for a lot of families and first timers that don’t have a lot of experience but great for more experience anglers that want to fish light tackle or jigs. Plus, the fish are pretty close to shore in flat blue water which just adds to a great day! 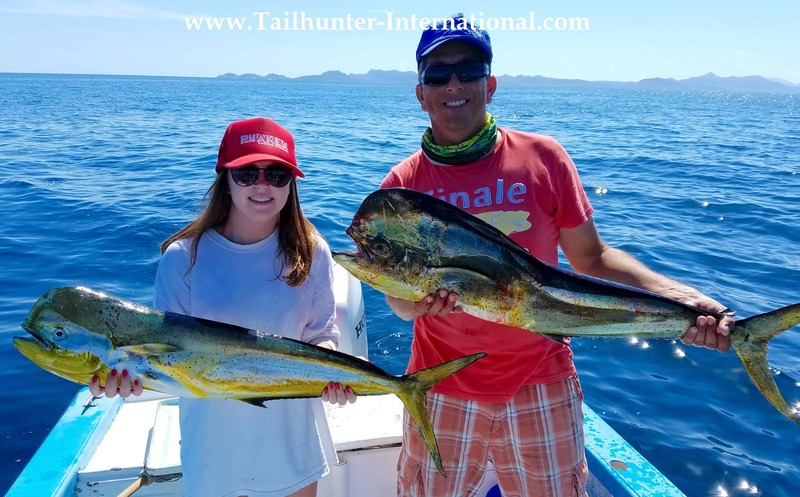 On top of it, we’ve got a nice mix of 10-25 pound dorado; some rainbow runners; rooster fish up to 60 pounds plus lots of bonito for action and throw in a few cabrilla, pargo, triggerfish and the occasional wahoo and it makes for a fun time on the water and a lot of variety. Our La Paz fleet has been rocking now for about 3 weeks. Dorado are scattered in groups across the bay and from Espirito Santo Island to Cerralvo Island. Limits or near limits of 10-30 pound fish have been common with some boats hitting the “honey hole” and catching and releasing enough fish to be back to the hotels by noon. Just good fun fishing! As well, there’s been big blue marlin cruising in and out’ve the dorado schools also feeding on the smaller dorado which are raising a lot of interest but lots of other sealife as well to see including whales, dolphin, sea turtles and manta rays. 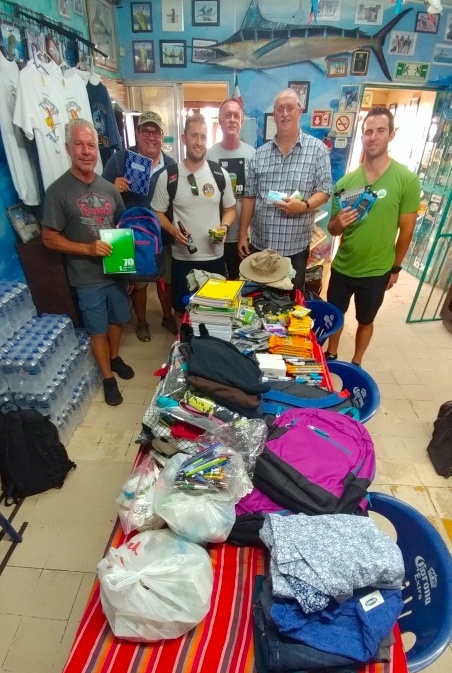 Good guys…big hearts!…Mike Scannell, Larry Morse, Jordan Boyd, Daryl Boyd, Glen Boyd and Derek Boyd brought down several ice chest full of school supplies, clothes, backpacks, toys and clothes for our Tailhunter community outreach program. Thanks for all our Tailhunter Tribe who brought down stuff the last two week for our Outreach Program. Several hundred pounds arrived and will be distributed. 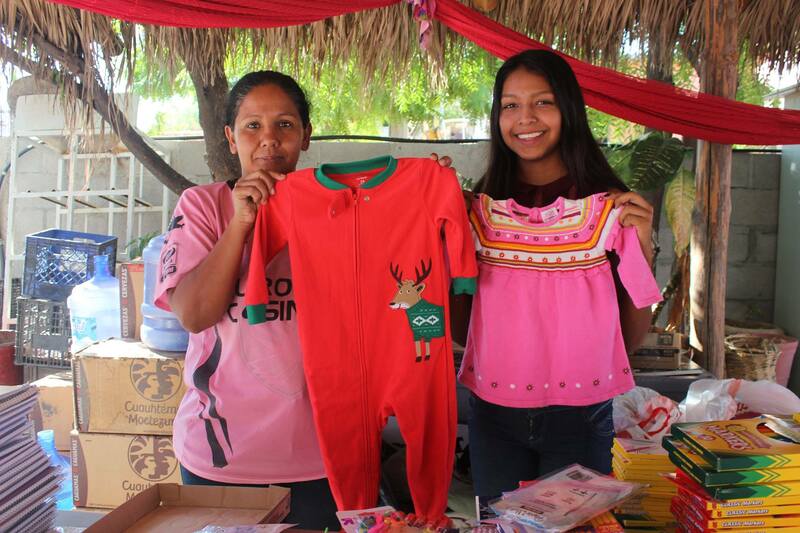 Last week’s donations went to the Care for Kids Program in one of the outlying disadvantaged areas as well as the Women’s Shelter. Weather – hot and humid. Days are mid to upper 90’s. Night’s mid-80’s. Very humid. Occasional tropical showers. Catching – Bigger the fish the harder to bring in (obviously!). 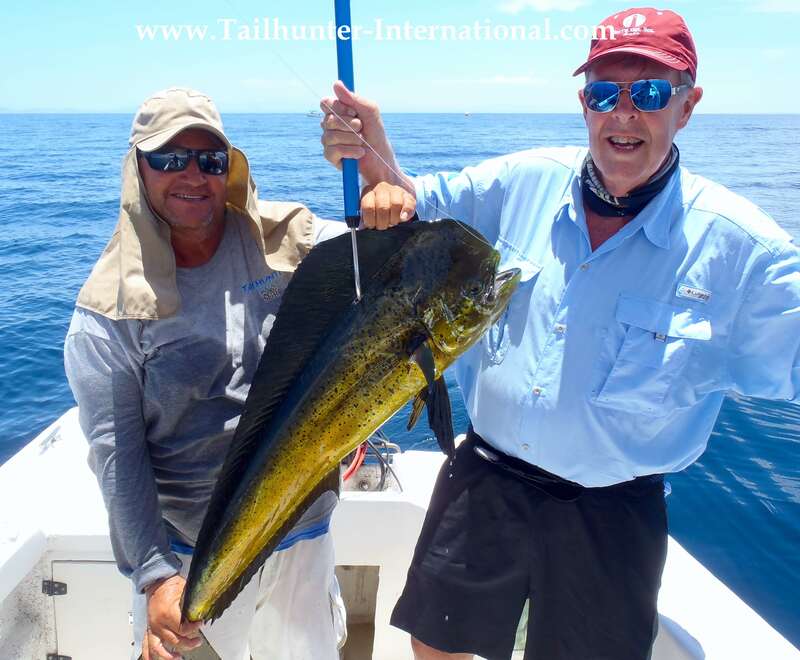 Bigger tuna and dorado are rugged fish! Joker in the Deck – Have no idea what this big solar eclipse Monday Aug. 21 will do! Screw with the currents? The tides? The Bait? The bite? 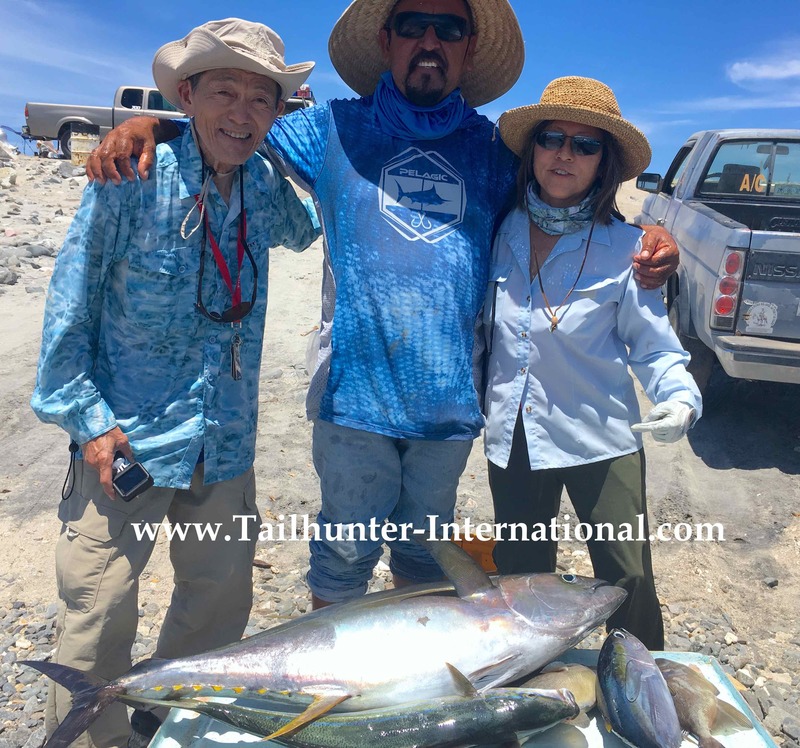 Our good amigo, Jeff Sakuda from Cypress CA who fishes several times a year with us and his favorite, Captain Jorge, took this slug yellowfin tuna on 30 pound test to start out his fishing week at Las Arenas/ Muertos Bay. Not bad…his first tuna…and his first fish!!! 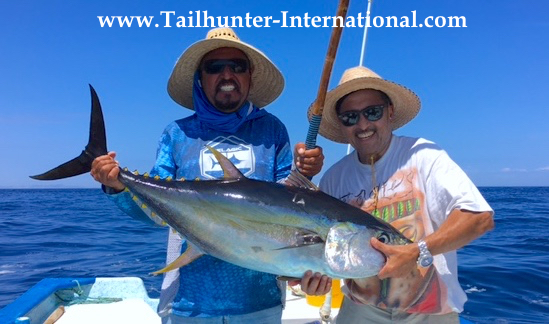 Nicholas Madrigal and Captain Armando and a tough 40-pound yellowfin tuna that put a serious bend in the rod! 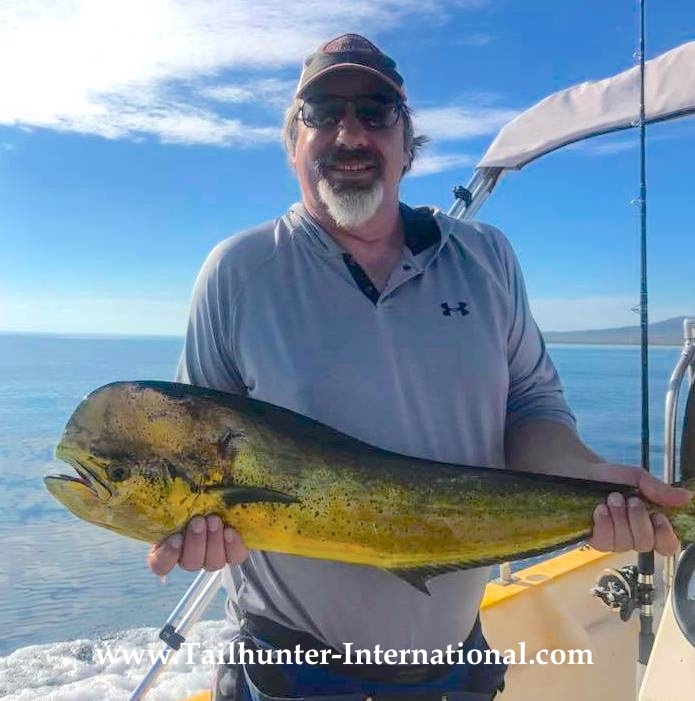 Cold Chavira from San Diego CA has been fishing our La Paz waters since he was smaller than the dorado he’s holding and just one of those guys who has always had the knack of putting great fish aboard like this bull dorado caught north of La Paz. 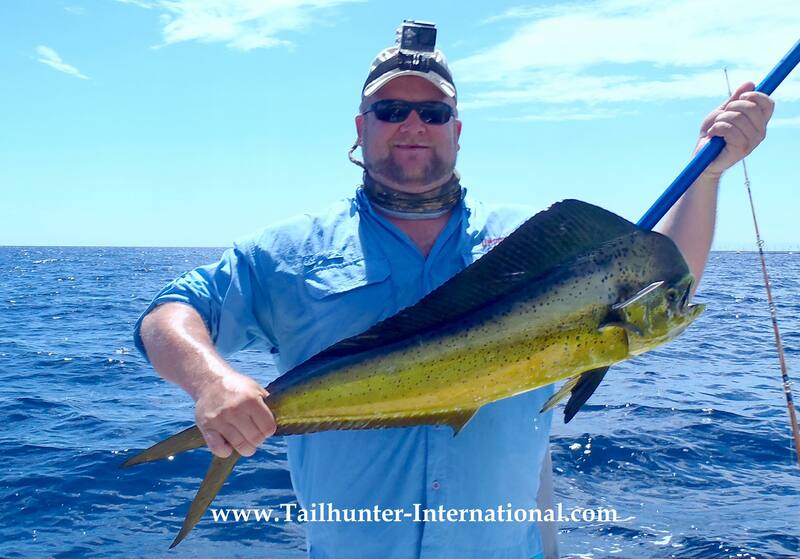 If you’ve ever fought a tuna…and fought one on light tackle…it’s not easy hefting it up for a photo after the battle! Caryn Aizawa got this one up for the pose! I see sashime for dinner! 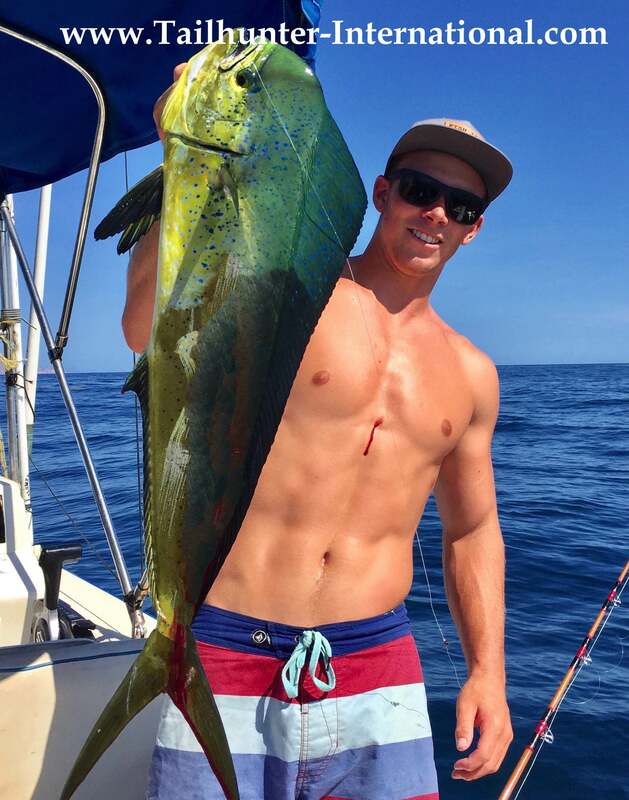 Another young guy from San Diego, Payton Gaston, did a number on this dorado to add to the box! Yes, it’s Caryn again. This time with a nice dorado and Captain Pancho while fishing out’ve Muertos/ Las Arenas. It’s been a while since anyone has hit anything on the flyrod, but Mark Aizawa managed a feisty bonito on the long stick! That’s alot of fish to hold up so best to just let it sit on the cutting table for Johnny Sakuda posed here with his tuna and Captain Jorge and Caryn Aizawa. 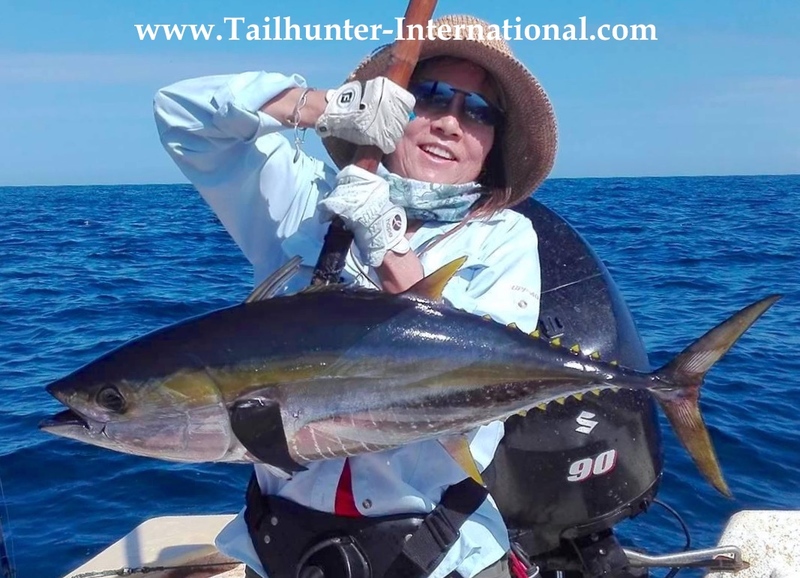 Check out the catch…another yellowfin plus a rainbow runner and some nice triggers. That’s alot of good eating there! This past week’s action can be summed up fairly easily in two words. Hot and dorado. The weather is as hot and muggy as you could want it with humidity sometimes running 60-80%…and that’s a 5 a.m in the morning! Thankfully, afternoon breezes blow it away later in the day. As for the fishing, dorado seem to have taken center stage for all intents and purposes. It’s been pretty steady more-or-less for the last 3 weeks. There’s been an occasional bump or two where the schools either can’t be located or when found, just don’t wanna chew, but then the switch gets thrown and we’re all good again for a few days. It will be interesting to see what the eclipse will do to the bite. I have no idea. It’s not like this happens every day! I believe the last time this happened was in 1918 and it won’t happen again for another 90 years or so. Will the fish be affected? Who knows? Will the tides and currents be different? I wish I knew! I’ve had some reports that some of the port captains around Baja plan to close the ports for some reason that just isn’t apparent right now. Will keep you posted. We did have some folks who told us that they purposely booked other dates because they were worried about the eclipse and others who moved their dates. It’s just something no one has ever had to deal with! I will say one thing…town is surely alot quieter this week. The local kids have all gone back to school. Tourists are also trickling out, especially the families as schools in other places are also going back to term and we head into the “low season” for tourism..but historically, the hottest part of the fishing season! The best action has been with our La Paz fleet. Limits or near limits of dorado have been the rule rather than the exception. The only issue pertains to size! If you hit a school of dinks…sure, you can catch and release a few dozen little grunts, but who wants to catch 12 inch babies? It gets old pretty fast. Hopefully, you hit the grown up batches of fish where you’ll get 10-25 pounders and then it’s bendo time. Occasionally, it’s a day of one here…two there…one here…another one in a bit. And by the end of the day you realize you’ve got a nice batch of fish. Other times, you could be totally skunk all day then at the end hit that one spot and it’s madness for an hour of double and triple hookups…then it’s all gone. And you’re exhausted and your gear is all busted up and you know it’s been a great day and head back in. Hard to say where the better schools are. They are in such a wide arc north of La Paz all the way from San Juan de la Costa to the west and El Rosario near Cerralvo Island to the eat and north to the Charro Bank. Bottom line is that there’s some pretty good dorado fishing to be had. As for Las Arenas/ Muertos Bay…hit or miss. There’s quite a variety of fish again. 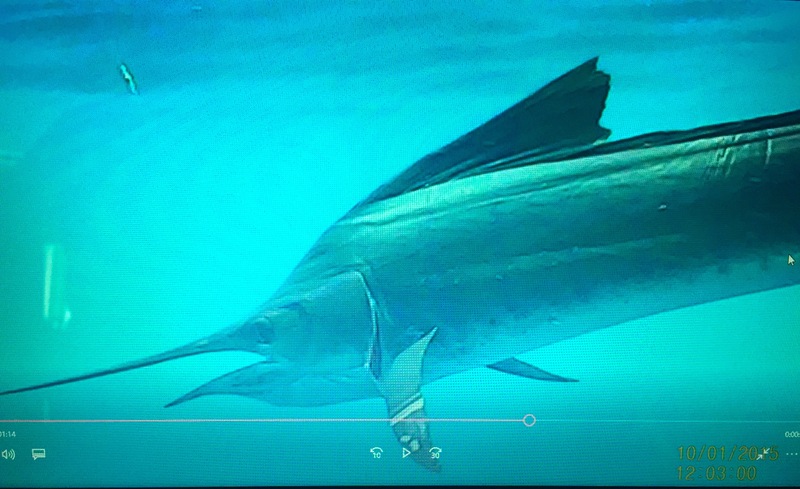 There’s some dorado…some billfish…an or rooster fish. In the rocks some cabrilla, pargo, jack crevalle and snapper. Bonito can pop up anywhere. Every day just seems different. But, late in the week…a surprise…TUNA! Some nice little scattering of 10-40 pound fish poked up north along the west side of Cerralvo Island where also (surprise) some sardines showed up. Something definitely worth keeping an eye on. Every panga seems to do something different. Had some crazy reports of some cooler water fish like sierra, yellowtail and amberjack popping up too. What a weird season! Every week our Tailhunter amigos and tribe bring us donations and I don’t always have the opportunity to post up photos or get all the names posted up, but our gratitude is no less for all your thoughtfulness. 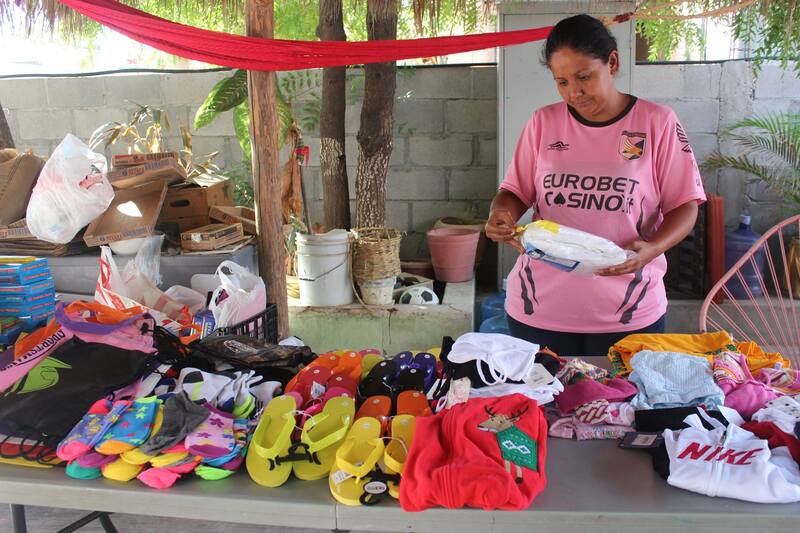 We just sent over several hundred pounds to CARE FOR KIDS in La Paz that helps out with some really impovershed areas. Check out the photos of the stuff YOU brought down the last two weeks that’s about to get distributed. Thanks more than you know! 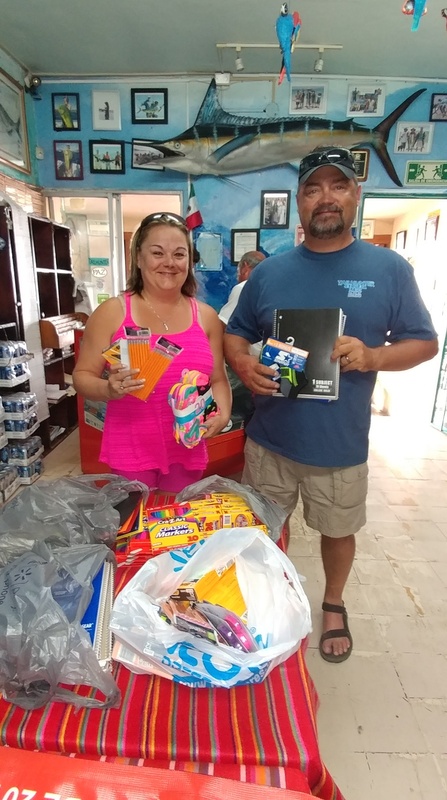 Our friends from Wyoming, Brandon and Tanya McGarr with a bunch of school supplies they hauled down. A little goes so far when you don’t have much! Lots of much needed treasures! Getting the tables ready to distribute to the neighborhood kids! Weather – Hot and humid. In California, they call it earthquake weather. Mid-90’s during day. Mid-80’s at night. Very tropical. Some afternoon thundershowers that come and go. Fishing – Terrible for Las Arenas. La Paz week started slow, but gathered speed and size as the week went on and dorado woke up. The dorado bite north of La Paz kept going despite a few hiccups here and there. Check out Brian Robertson’s nice bull. Brian is from Colorado. 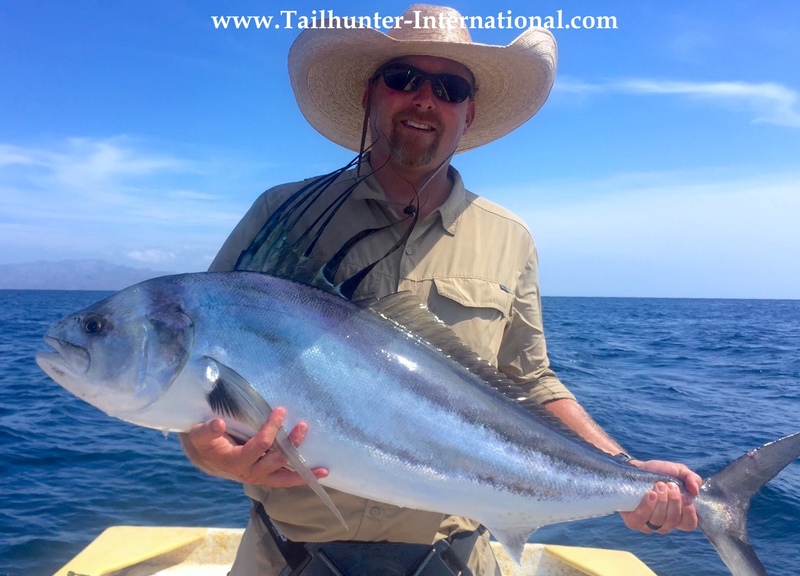 Dennis McLeod from Oregon with Tailhunter Captain Joel rocked this large sailfish that Dennis says is his first “big game” fish. 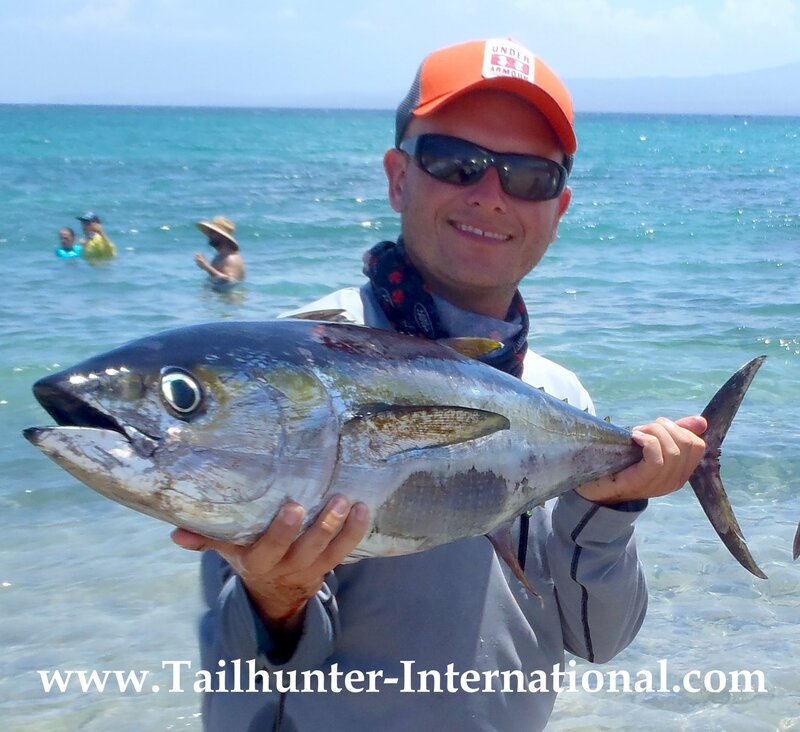 They hooked it off Espirito Santo Island and cheers to Dennis for the quick photo and release. Another great underwater shot below of the fish taken by Roger Hall. Underwater shot of Dennis McLeod’s sailfish taken by Roger Hall. The guys released the fish. 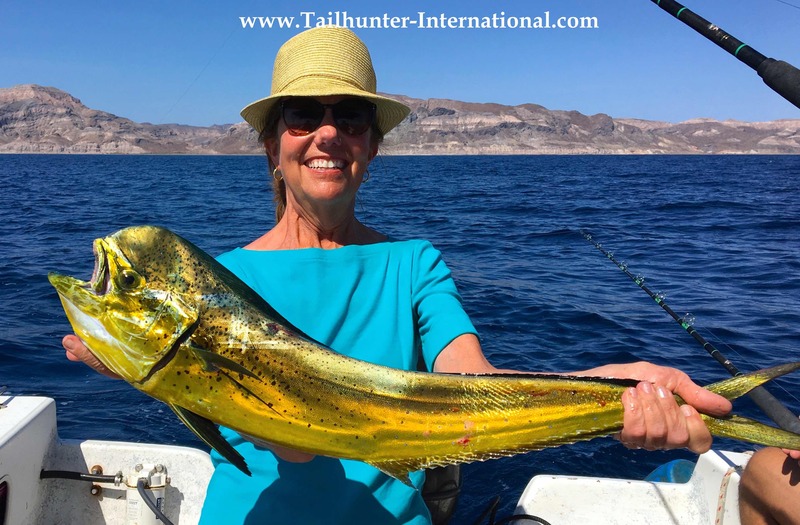 One of the funniest guys we’ve ever had visit on his first trip to La Paz to fish with us, Mickey Cohen, from Lake Havasu took almost an hour on this big bull dorado on light tackle. 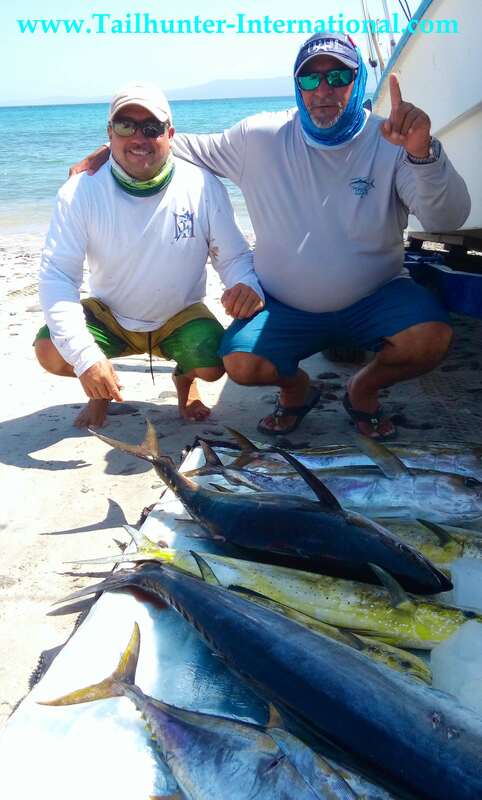 It was Mickey’s first time dorado fishing and he put the wood to a number of fish this week. Mickey is a big guy so this fish is alot larger than it might look! Our long-time, amigo, Dave Rose, drove all the way down from Washington to spend a few days fishing with us. 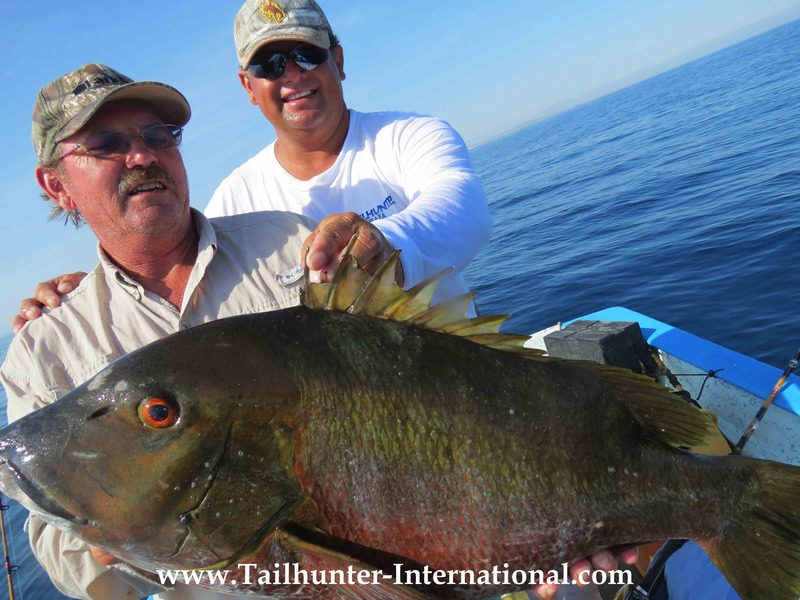 He shows off one of his dorado caught while fishing with Captain Pancho out’ve Muertos Bay. I think my favorite photo of the week! 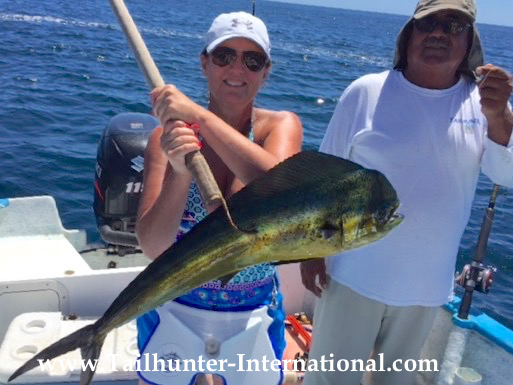 This is Captain Pancho with Ruthie and her first dorado! Ruthie lives in Utah and came to visit with her family. 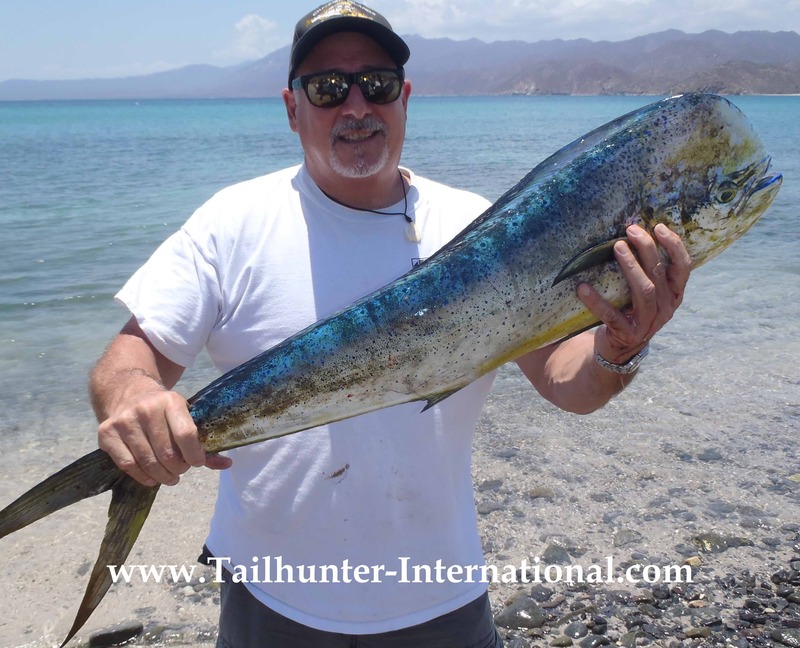 Kent Williamson from Colorado had a nice three day trip with us and poses with one of his dorado and Captain Rogelio from our Tailhunter La Paz Fleet. Our best fishing buddy, Sherman McDonnel from Rock Springs WYO with his favorite Captain Armando loves to fish light tackle and sometimes pays for it..in a fun way…like when this huge roosterifsh hit his 17-pound test and he ended up battling the beast for an hour in the blazing sun! But, he always gets his fish. Nicely done and a nice release too! 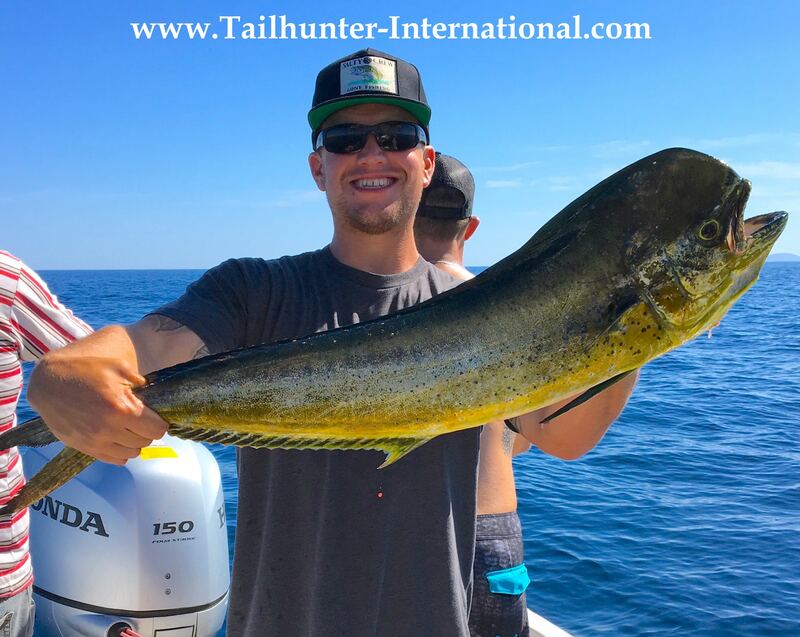 Another of our new Colorado amigos…Nate Jarvis…got in 3 days of some pretty sweet dorado fishing especially with our Tailhunter La Paz fleet. 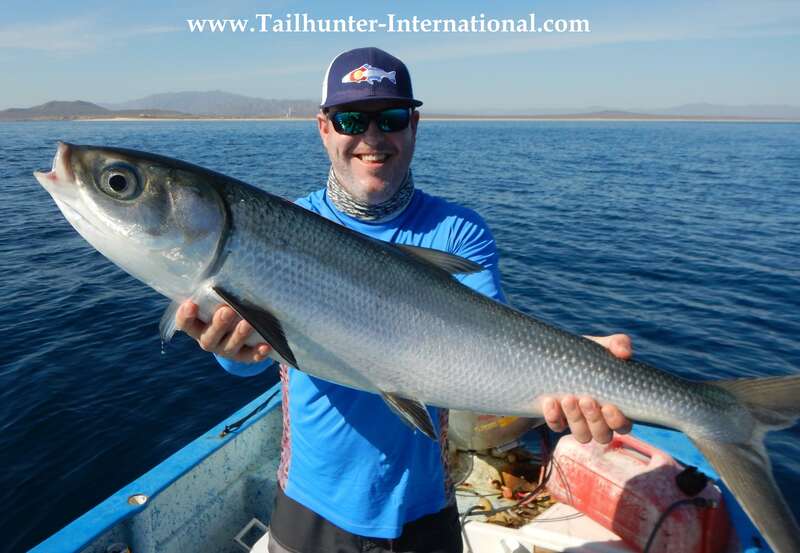 From Colorado, Brian Williamson, caught and had a nice battle with this milkfish while fishing just off Punta Arenas with the Tailhunter Fleet. It looks like a giant sardine that has been hitting the steroids. Schools often swim through the area but the fish are rarely ever hooked because they eat algae. Occasionally, one gets snagged. However, this particular one ate a mackerel! He went off the vegetarian menu and got hooked. They can grow to 5 feet long and weight up to 30 pounds. The fish was released. They might not taste real great, but hit a few of these “toro” jack crevalle and your arms will tell you that you’ve been in a battle. Mike Hall got a big jack here! DORADO PLAY GAMES BUT FINALLY COME AROUND! Given the great week of dorado a two weeks ago and all the hoopla, the current week started off with some nervousness. Sure, there was a full moon, but full moons don’t normally get us. In fact, some of our best bites are during full moons. But, the dorado had finally gone on a tear and it looked like things were finally kicked in. And we were high-fiving ourselves and then the week started and the fishing was barely lukewarm. What had changed? Where did all the dorado go? How come the dorado we were seeing looked bored? Who flipped the switch? Well, some parts re-bounded. I don’t know what happened with Las Arenas. Two weeks of pulling teeth that has everyone shrugging their shoulders. Clients hung tough. Captains worked like crazy. And it just wasn’t happening. 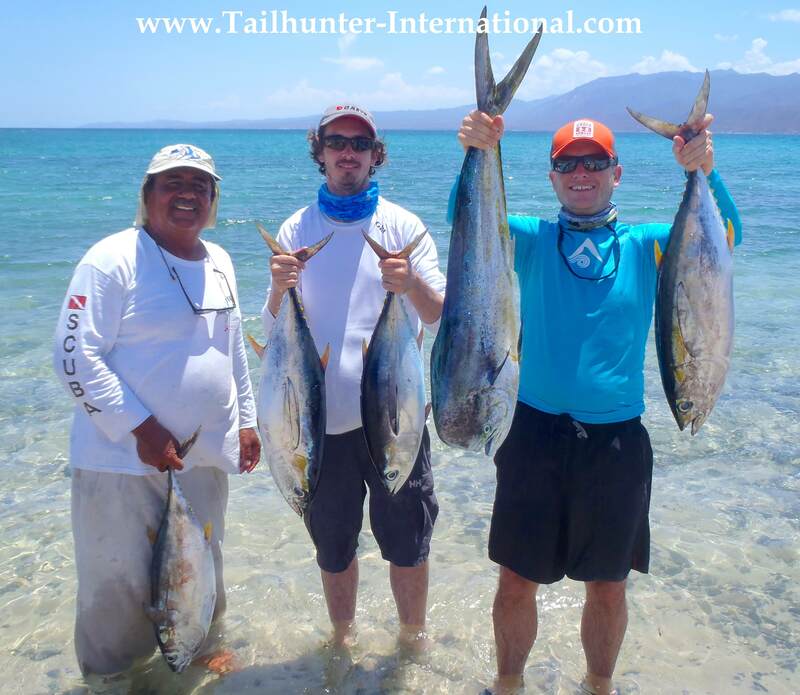 Sure, there was the occasional “nice catch.” But for the most part, pangas were catching…1 dorado and a bonito. Or 2 dorado. Or 2 bonito and a cabrilla. Maybe a jack crevalle on another boat. Folks weren’t missing fish. There just weren’t any fish hitting or being found. Conditions looked good. Water seemed OK. Full moon? Will keep you posted. As mentioned at the beginning, the first few days of the week were really disappointing. 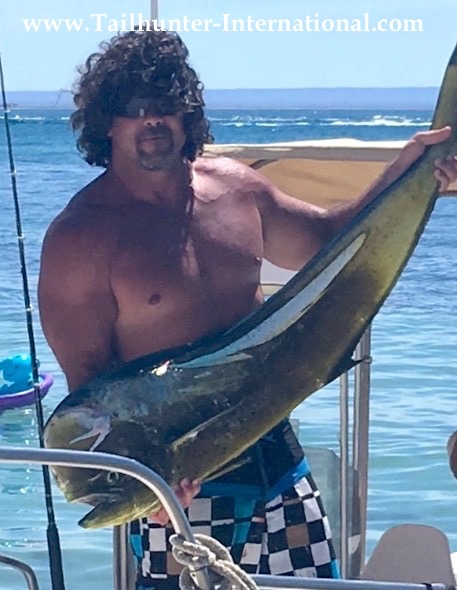 The WFO bite of dorado turned into a whimper. We scratched for a few dorado. After blowing my bugle that the dorado were “on” I looked like I had egg on my face. 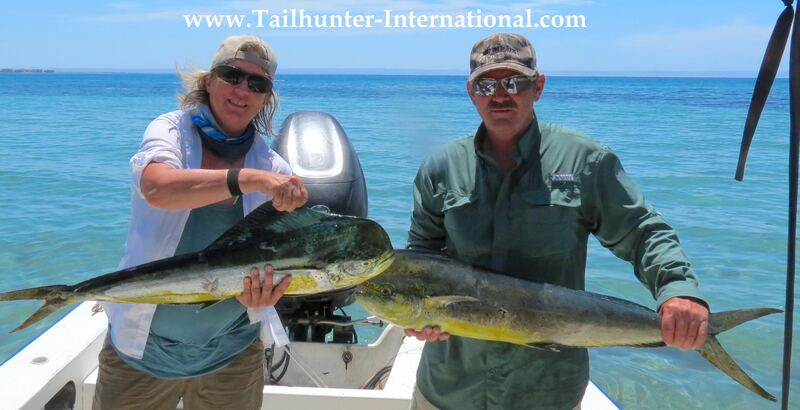 We were seeing dorado, but they lockjawed and could care less about baits, feathers or lures. Then, about mid-week the dorado got found and they got interested again! The first schools we found were rats. Literally rats. It was the dorado nursery. Schools and schools of itty-bitty dorado that were about the size of planter-trout. I’m not kidding. It was Happy Jack’s Trout Farm. Except they were dorado. Sure, you could catch a couple of dozen, but the novelty wears off after the first few then you start releasing fish-after-fish. 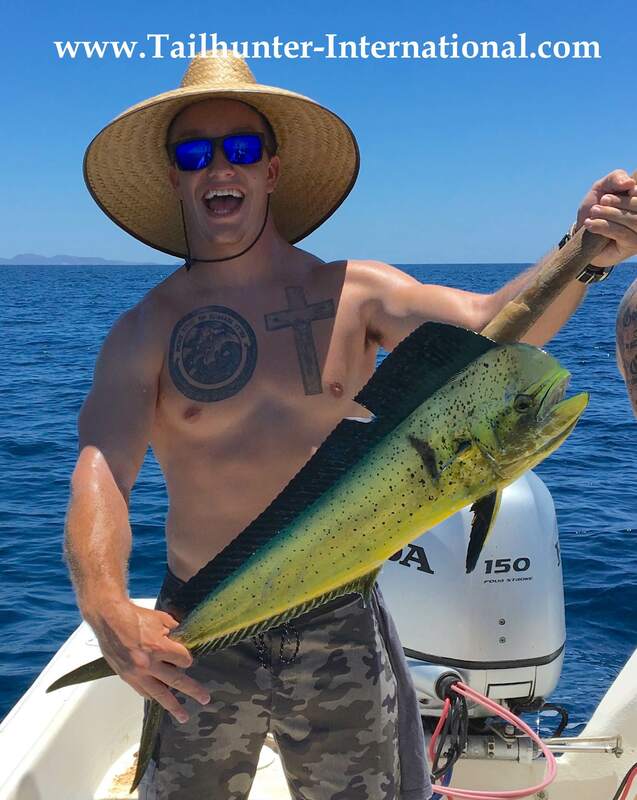 No one comes to catch 12-inch dorado. But, at least they bit. Then, we found the schools of bigger boys and legit 10-20 pounders started slamming like they are supposed to. Some of my captains asked me not to give away the exact area, but it’s holding loads of nice floating sargasso weeds and some lit up dorado jumping over each other to hit the baits with double, triple and quadruple hook-ups. Some boats got limits…caught and released others and made it back to La Paz in time for shrimp and beer for early lunch. Limits were more the rule rather than the exception. Hope we can hold them now for the rest of the season! 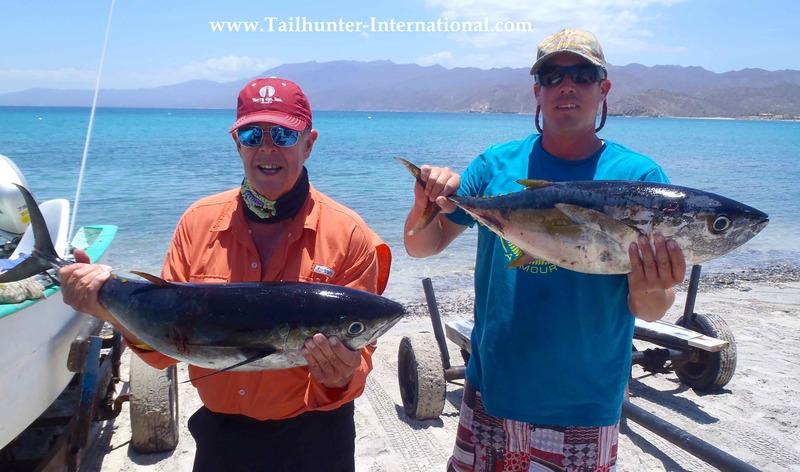 Fishing – (Las Arenas) – Slow and sticky like the heat. Good variety but tough fishing . (La Paz) . 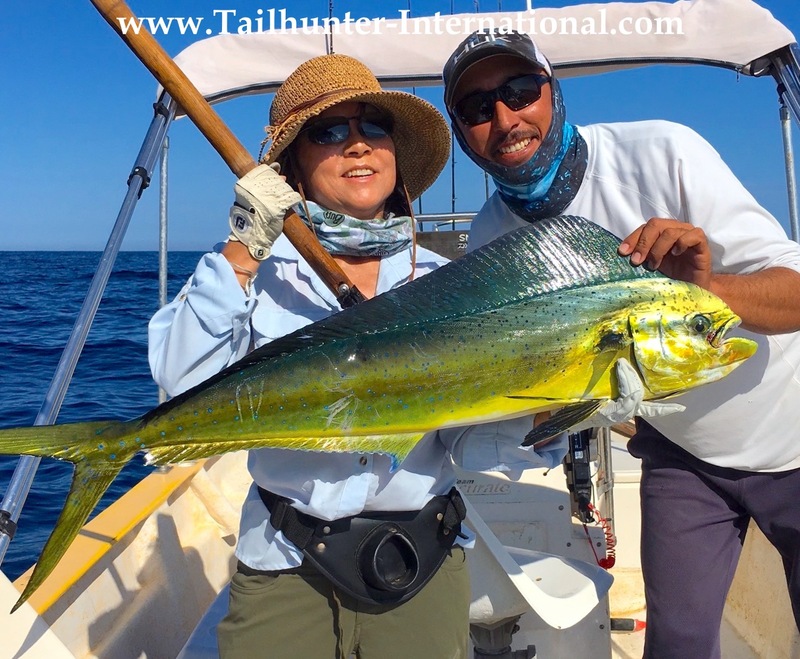 Best fishing of the year…maybe in several years for dorado! Whoa!!! That’s an armful of big dog-tooth snapper for our good amigo, Wil Dolinar from Wyoming! 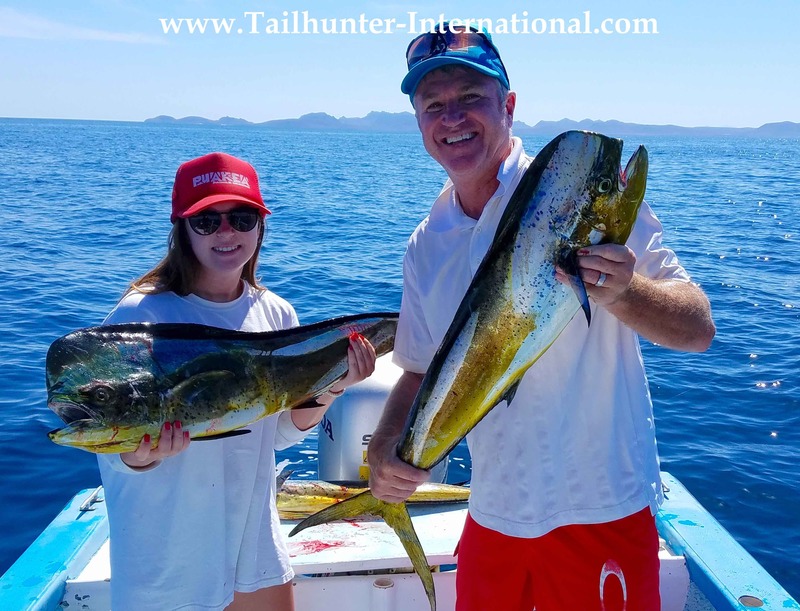 First timer friends from Utah with Taihunters, Curtiss and Jeri Frost, got into the big dorado bite and started their week with a pair of nice bull dorado. 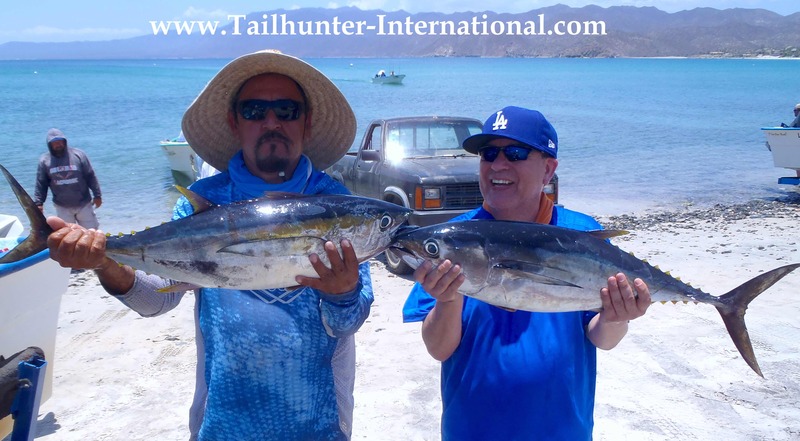 Steve Holguin sporting his famous Dodger hat every year back with his favorite Captain Jorge and a paid of nice yellowfin tuna from Las Arenas for his first of 3 days fishing. Darrell Manginelli lives on the Ventura CA area and has already made two trips to fish with us this year! 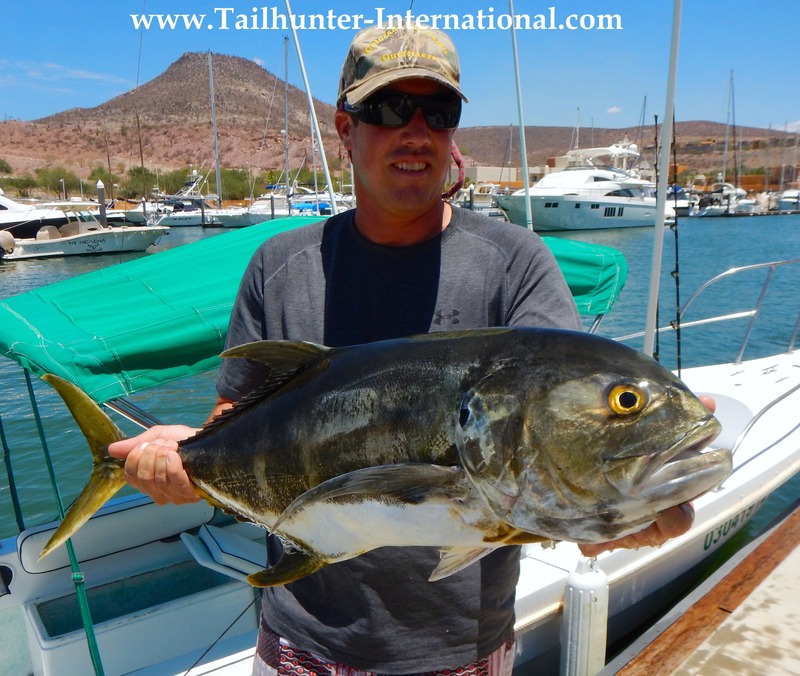 He’s posing here with one of the larger bull dorado caught this week with our Las Arenas fleet. He didn’t get many fish this year, but he got some of the biggest! Our light-line specialist amigo from Rock Springs, Wyoming, Sherm McDonnell and his favorite Captain Armando looks pretty worn from tangling with this big barred pargo. But, we tease Sherm every year for fishing with 17 pound test…but to his credit he always well! 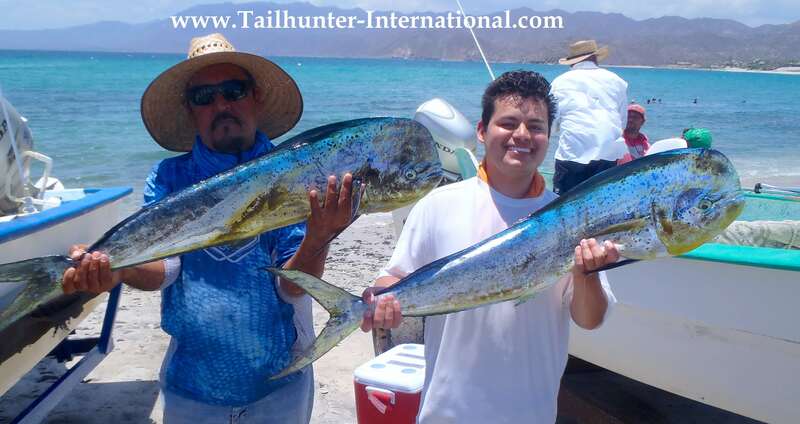 Big smile for Jonathan Alegria and one of a number of his dorado to start his fishing week with us. Jon lives up in Santa Barbara CA. 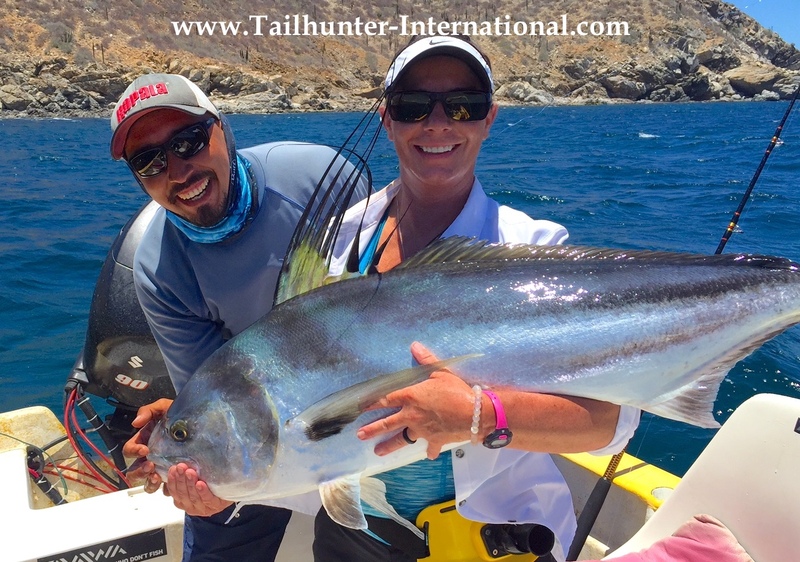 I love this photo of Captain Pancho all smiles with Stacy Dolinar from Wyoming and her first of several roosterfish for the week she caught and released. Note how close to shore these fish are caught! 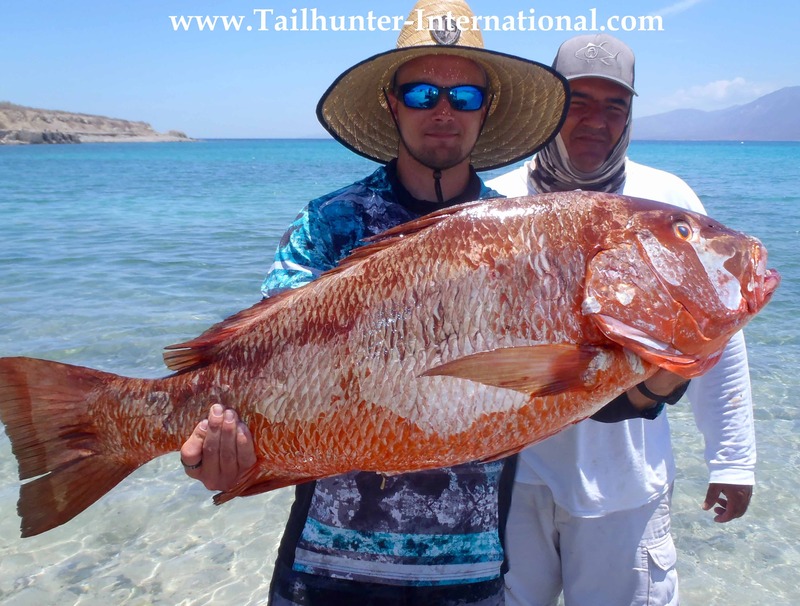 Visiting us for the first time, Ryan Vorisek from Upland CA had quite a week topped off by this massive dog-tooth snapper he caught while fishing with our Tailhunter La Paz fleet and Captain Gerardo! All the way from Jamaica, Nicholas Chen was able to get a rooster with us mid-week while fishing with his dad, James, who’s in the IGFA books! 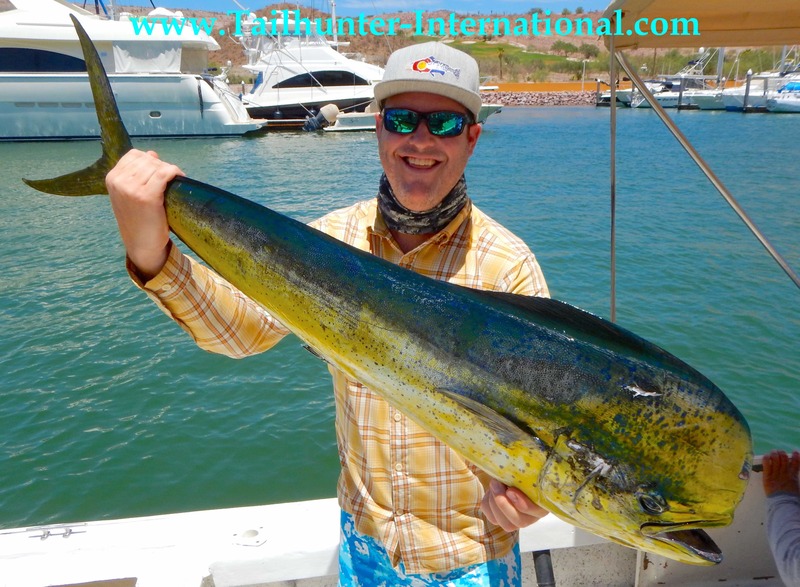 Happy guy with another dorado, Matt Alegria from San Diego CA hangs another dorado with our La Paz fleet. He and his family donated all their catch to charity. 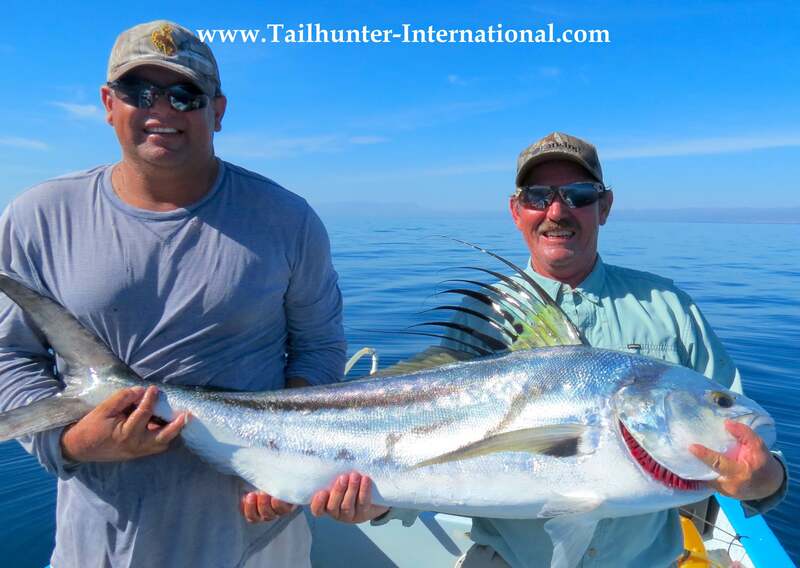 Wil Dolinar from Rock Springs, Wyoming finally got his big roosterfish on the last day and the last hour when he hooked and released this big guy fishing with Captain Pancho then suddenly the other rods went off and he got several dorado! Great way to wind up the week of fishing. These two love to fish! 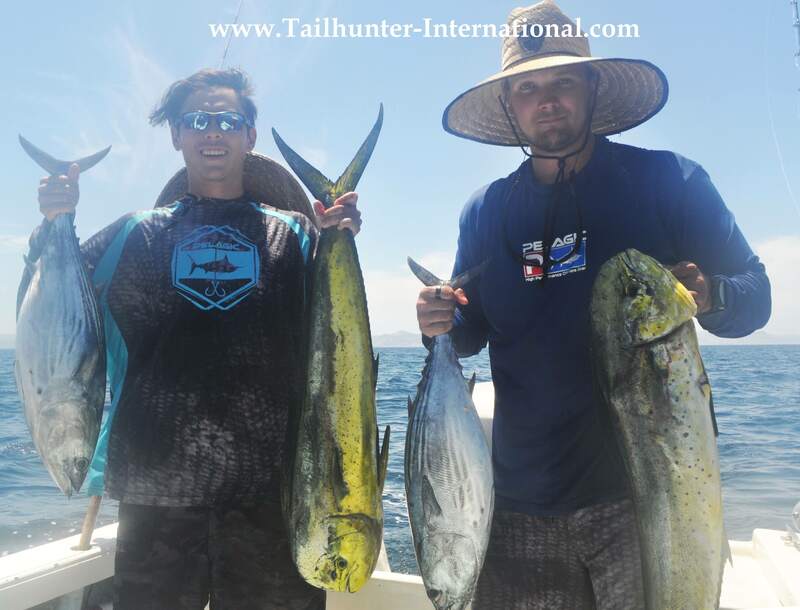 Trevor Akiyoshi and Ryan Vorisek hold up a few of the dorado and big bonito they hung fishing with our Tailhunter La Paz fleet. 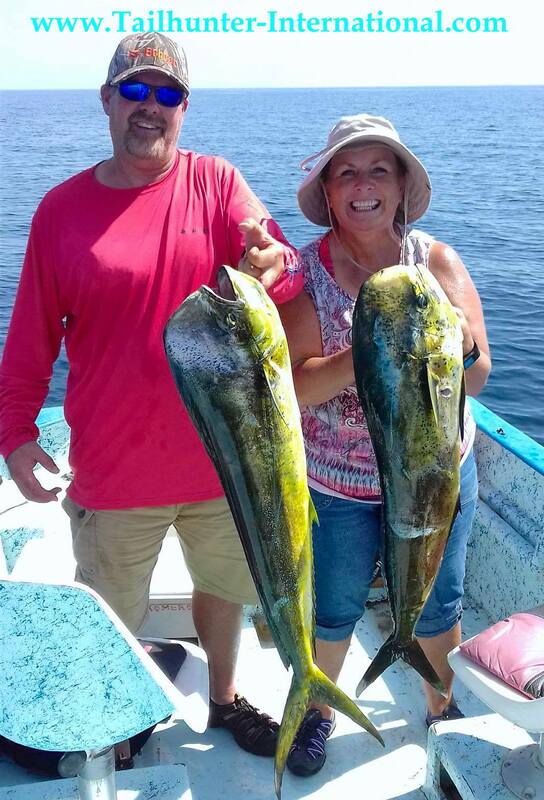 These two love to fish the light tackle and know what to do with it as they Sherman and Shelly McDonell show off a couple of their dorado after they limited on one of their days fishing with our La Paz fleet. Over the many years they have fished with us, they always manage some great catches! 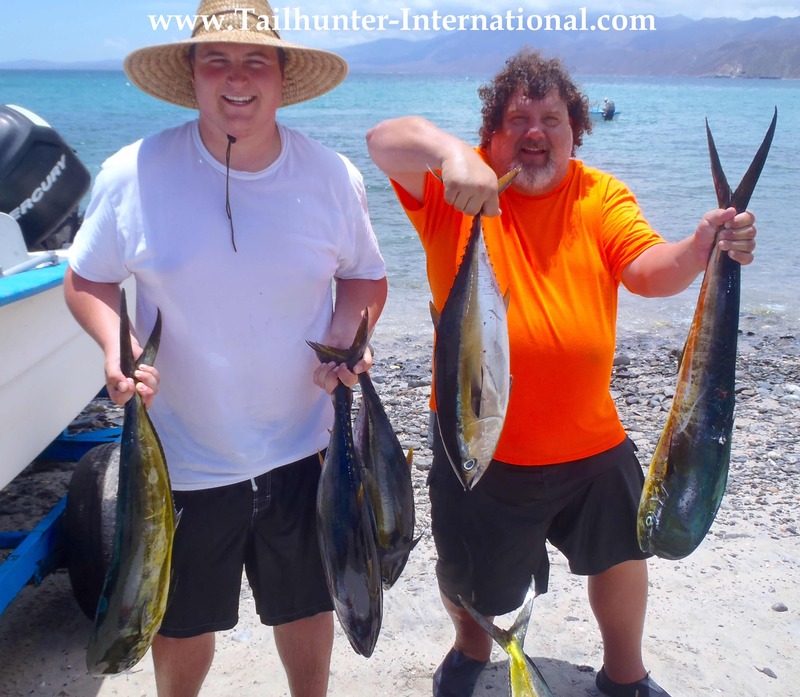 Some new Tailhunter amigos from Colorado, Kent Williamson and son Brian found a few of the yellowfin tuna the day they fished with our Las Arenas Fleet and racked up some great dorado with our La Paz fleet over 3 days. 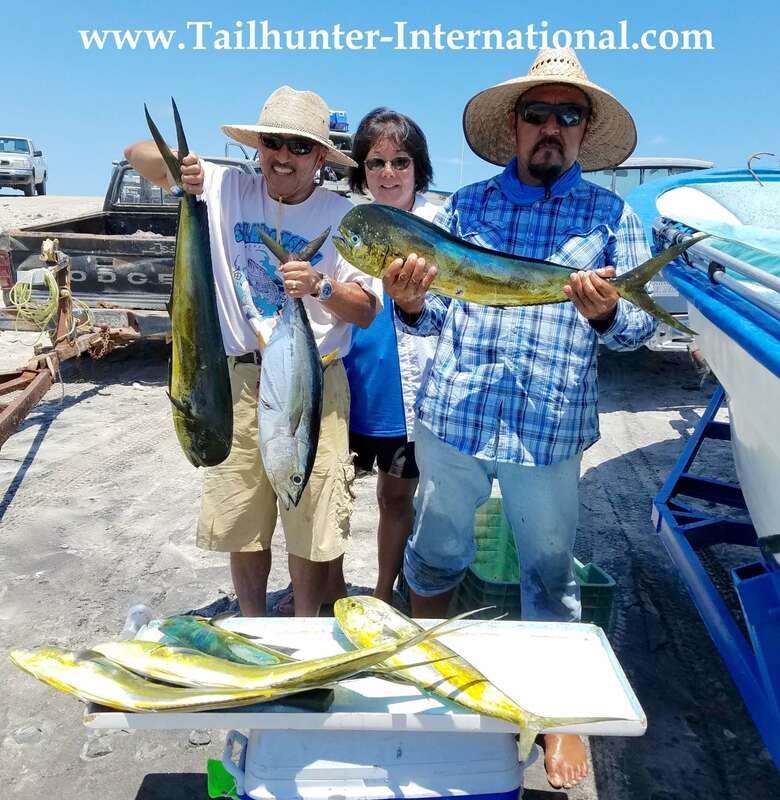 From San Diego area, Francis and Gina de Paolo had only time for one day of fishing and fortunately, we got them into some pretty nice dorado fishing with our Tailhunter La Paz fleet. Always good to make new fishing friends as this was their first time down. Double pargo for Mike Akiyoshi and Ryan Vorisak on the beach at Muertos! Great eating fish! 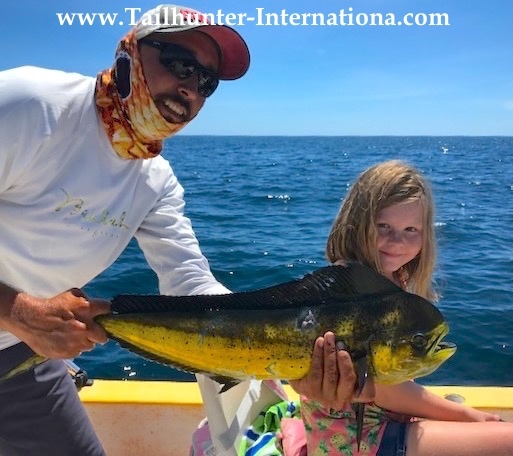 Madi and her dad, Jim Denver, had only 1 day to fish and I just happened to have one of our pangas available at the last minute but hammered some great dorado. Especially good because it was Madi’s first time fishing in La Paz! Such a fun lady! Sharon Alegria from Altadena CA could not have been more excited or thrilled with every fish she caught. It was her first time with us and we sure hope to have her and her smile back with us soon! Captain Jorge and soon-to-be attorney Marco Holguin in his last year of law school in New York comes to visit us every year with his dad and poses for the camera with some of the larger Las Arenas dorado! Always great to have first-timers with us! 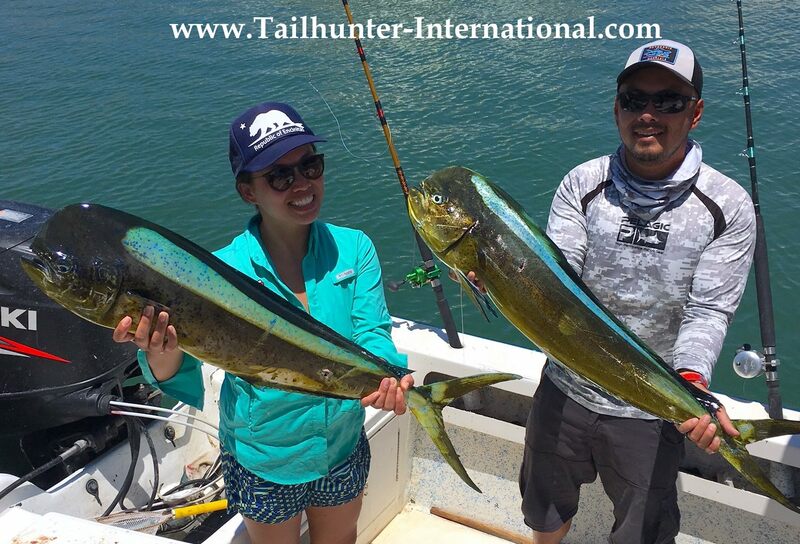 Captain Joel and Madi Denver show off a couple of their La Paz bull dorado after a full-day of great fishing. Her 2nd roosterfish of the week! 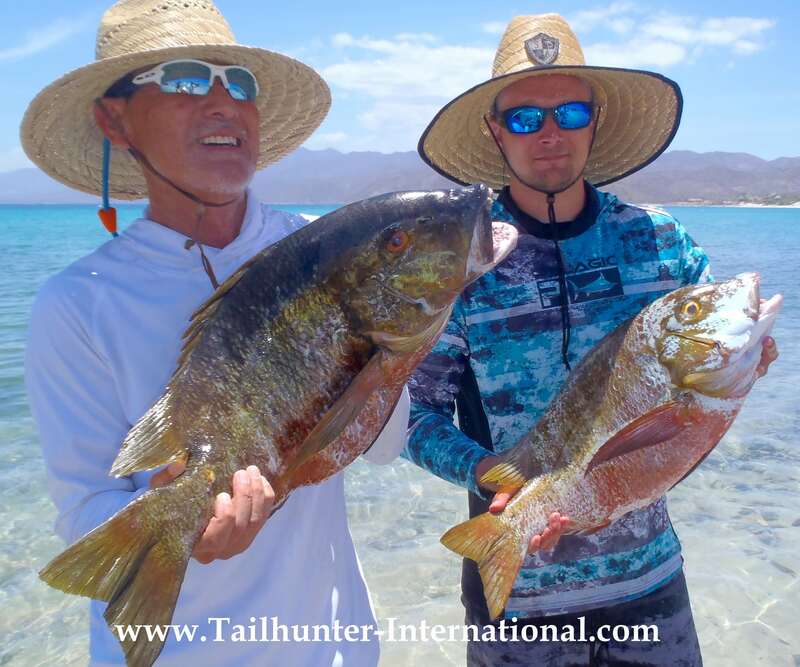 It’s Stacy Dolinar with Captain Pancho again right off the rocks south of Bahia de los Muertos! The fish was released too! From Pasadena CA, Chris Alegria looks a bit serious after racking another dorado, but he and his brothers were great fun to have visit us this week and got into the wild dorado. This “pirate” has been coming to visit us for years and can get a whole van load of guys laughing. 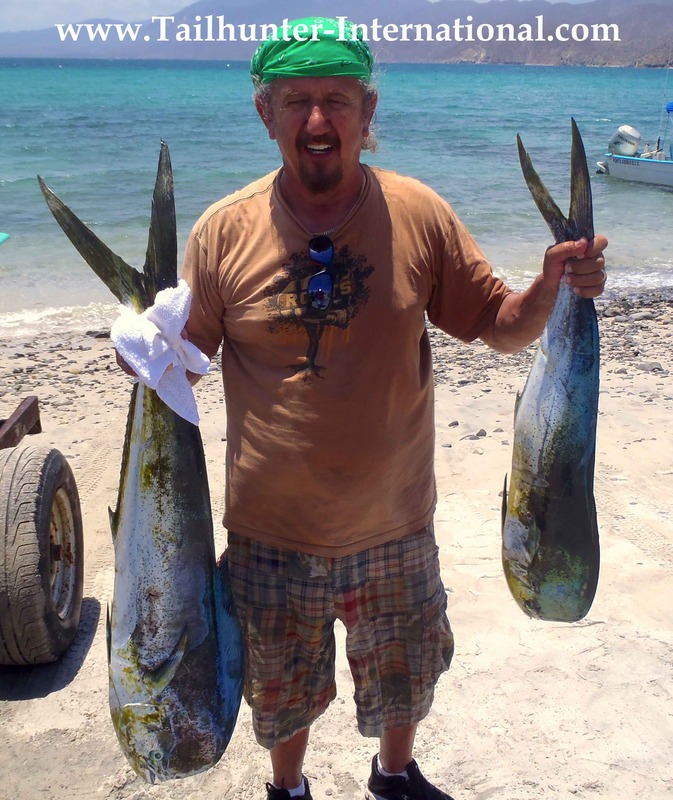 It’s Vic Gildelmontes with his hands full of dorado! DORADO…LIKE BACK IN THE DAY! Let’s go with the bad news. Or slower news. Our Las Arenas Fleet had some really picky fishing. It just flip flops from week-to-week. This past week must have been Las Arenas’ turn to go slack. 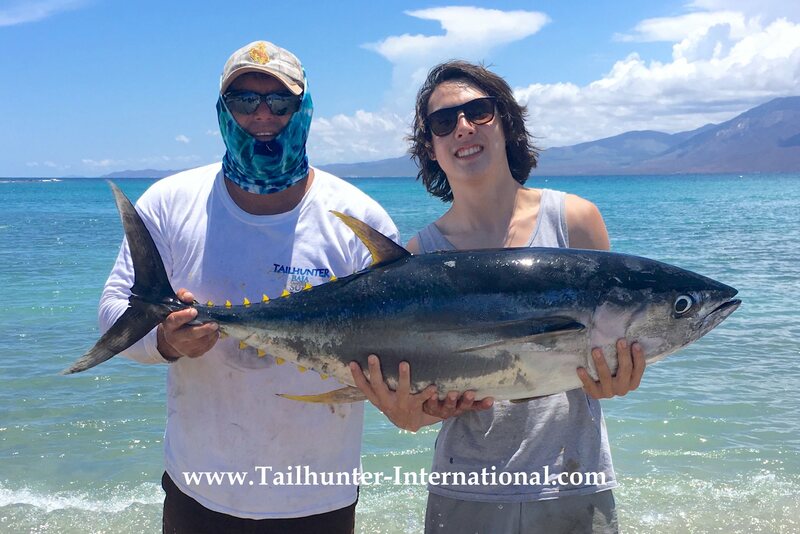 The clients and our captains really worked hard to get the bites. Everything looked good. The fish just weren’t biting that well. There were a few dorado here and there. A few rooster fish, but not many…but that could have been because everyone was chasing other species. 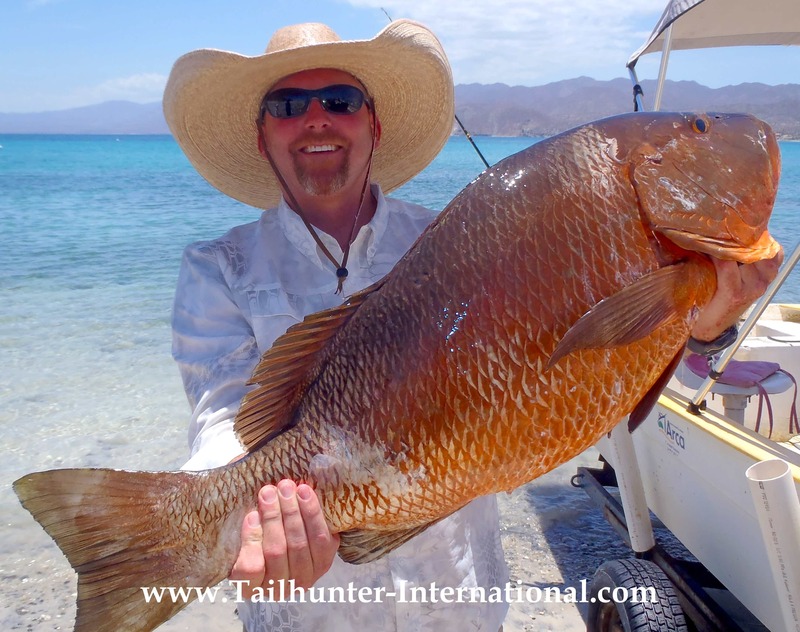 We had a few marlin on and got a few more of those huge big cubera (dog-tooth) snapper. Add in some stray jack crevalle, bonito, pargo and a tuna here-and-there and that was it. At best it was OK. At worst, it was dismal. And there was surely some variety, but it was hit or miss with a lot of misses! Yes…it was that kind of a bite for many of our anglers and many days this week. There were a few bumps here-and-there, but for the most part it was the kind of wild dorado bite we’ve been waiting to happen. It really was like “back in the old days!” We probably have not seen this kind of bite in about 3 years and surely, it was our best week of the year in terms of quantity and quality. These were all legit 10-20 pound fish too! The last few years, a 5-pound dorado was typical. 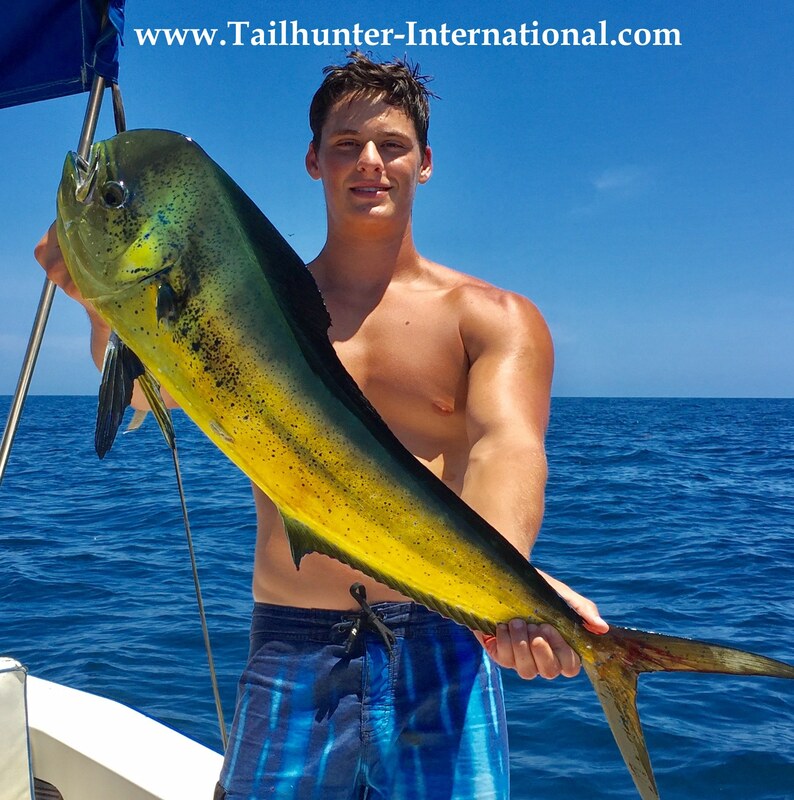 This week, they were all healthy strong young mahi-mahi and tore up almost anything tossed in the water. We honestly did have boats back early on several occasions in time to eat lunch back at the hotels. I don’t know if this will keep up. I hope so. We’ve been waiting a long time for this to come back! 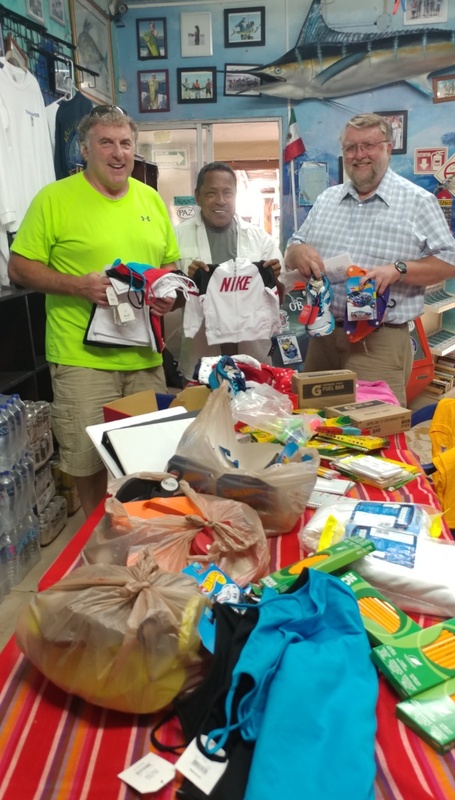 Our three amigos from Oregon who visit us each year Dennis McLeod, Roger Hall and Wes Perkins brought several ice chest full of kids clothes, shoes, school supplies and other donations that will go so far down here! 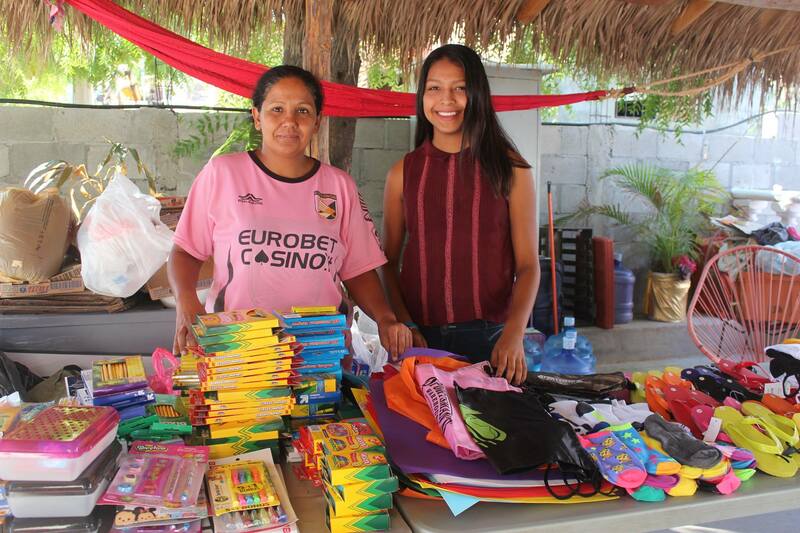 Many thanks for all our Tailhunter amigos who brought donations down this week for our Tailhunter Outreach Program. I’m sorry I didn’t get photos of everyone, but big shout out to Wally and Jeff Lee from San Francisco, The Williamson guys from Colorado, the Alegria family from So. Cal and also to the Dolinar Family and Sherm and Shelley McDonnell from Wyoming who each donated $300 to our FANLAP scholarship that takes care of one child each for an entire school year . Taihunter Tribe members are the best!